I’ve really been trying to do less needless shopping in order to save up money for my England trip in 6 short weeks. But I have been looking for one item in particular for my trip: a traveling dress. Since my British Airways flight will last a cool 8 hours, I won’t want to be wearing awful stuff like real pants. So I’ve been scouting out a comfy dress to wear on the flight that will both allow me to snooze and then allow me to look fab for B when I stumble off the flight. Hold your horses. I’ve got a plan. First, you gotta see the dress. ADORABLE, right? It’s made of jersey cotton and it’s clingy without being tight. To stay warm, I’m adding some tights under boots. 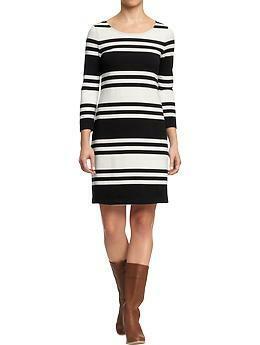 And, since the dress is a neutral (all part of my secret plan), I can pair it with any color scarf, cardigan, or jacket. I wore it last night to formal meal and everyone said I looked like hot stuff. Are you ready for this hotness, B?! I don’t think so. Photo of the Day: Throwback picture! 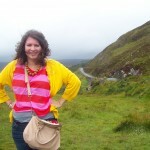 This is from last summer when I studied abroad in the UK. Check the archives for more study abroad tales! One of my favorite stories from my study abroad experience at the University of Oxford in England is about crepes. I was out shopping one day, a day that happened to be one of my last abroad. I had just purchased an excellent new turquoise handbag and a hot pink skirt with rosettes at Primark. I was on a shopping high. And when I say high, I mean high. Colors were brighter as I exited the store. I was so thankful for the sunshine and the blue sky and being in Oxford and I thought I was the happiest I could ever be—until I saw the crepe truck. The crepe truck seemed like an oasis in the desert (even though, in this metaphor, the desert was pretty awesome). I had never had crepes before. During my trip to France the previous year, I opted for steak frites and chocolate mousse at the fancy pants cafe we went to rather than crepes. So, of course, I stepped up in line. The line was fairly substantial, so as I waited I watched the crepe man work. He carefully poured the batter on the griddle and smoothed it out. 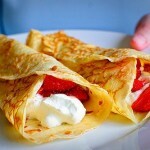 As that cooked, he pulled another crepe off another griddle and piled in with freshly whipped cream and berries. His movements were smooth. He was a skilled crepe man. I finally approached Mr. Crepe Man, handed him my 5 pound note and asked for Nutella crepes. With banana. As he crafted my snack, I tried to control the drool. He eventually handed me a tray filled with a huge crepe folded over several times and smeared with hot melty Nutella and tiny slices of banana. I walked back to my dorm, eating my crepes as I walked. I looked at the old buildings covered in ivy while chewing. I savored the chocolate hazelnut taste as I passed all my favorite places in Oxford. I spoiled my dinner that night. It was worth it.